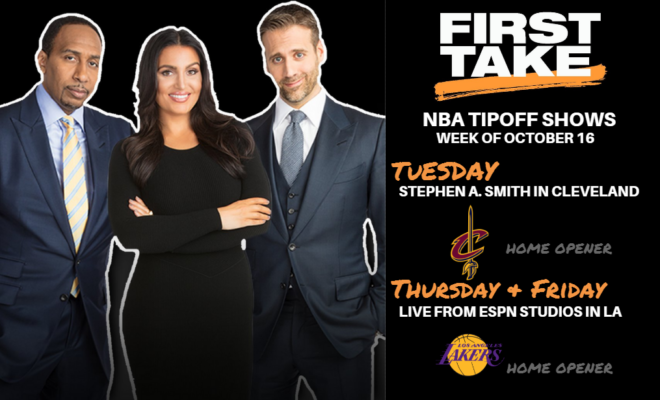 First Take – ESPN’s weekday morning studio debate show featuring commentators Stephen A. Smith and Max Kellerman with host Molly Qerim – is hitting the road for NBA Tipoff Shows. On Tuesday, Oct. 17, Stephen A. Smith will be live from the Town Hall Ohio City in Cleveland, Ohio, for the Cavaliers home opener. Then on Thursday, Oct. 19, and Friday, Oct. 20, the whole team will be live from ESPN Studios in Los Angeles for the Lakers home opener. The show in Cleveland will be open to public and free of charge with doors opening at 8:30 a.m. ET. The First Take team will be joined by special guests, based on the sites, including former NBA player Tim Legler in Cleveland and actor Jamie Foxx and former LA Lakers coach Byron Scott in Los Angeles. First Take airs weekday mornings from 10 a.m. – noon on ESPN, focusing on the most compelling and entertaining topics of the day from the world of sports. Since First Take moved to ESPN on Jan. 3, the show’s audience (P2+) has increased 16% and in September, First Take enjoyed a 31% increase in overall viewership over the previous year. Read more ratings info here. The program is streamed live on the ESPN app, and will continue to be re-aired on ESPN2 each day. 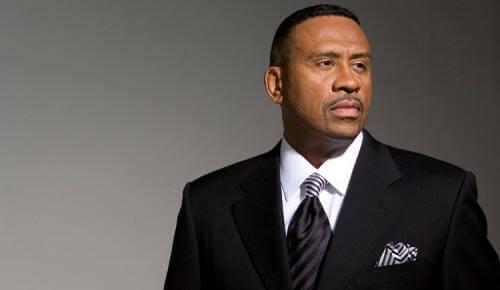 Follow First Take on Twitter, Facebook or the Podcast for more updates and information.